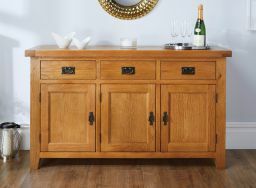 Country Oak 3 drawer 3 door sideboard. You get lots of storage in this great looking medium sized sideboard with its spacious 3 cupboards with shelves inside. Fully assembled ready to use. We have priced these at rock bottom prices to ensure that these are the best value in the UK. All drawers have dovetail joints. 100% solid real wood drawers and backs. No ply. 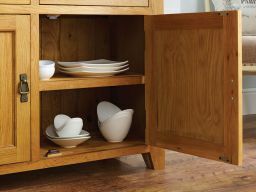 Made from sustainable American oak. Good Quality Finish & Nice size for our Hallway. Excellent quality and very solid. Extremely happy with our purchase and would definitely recommend! Easy to find the item we required on your website. Great communication and delivery. 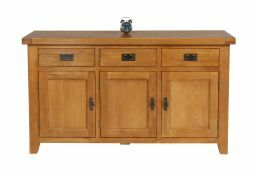 The sideboard arrived and is fantastic.. Looks great and matches in with our table and benches already purchased. Great value for money very pleased with the unit. Quick delivery. Solid construction, classic design. Excellent for extra storage. Recommend. Excellent quality, it looks great and has provided much needed extra storage space. We have had several items, dining chairs, nest of tables and bedside tables. We have been really pleased with them all. The delivery has also been excellent. Arriving when stated and a phone call 30 minutes prior to arrival has been much appreciated. Pleased with it , good value , delivery staff very pleasant. Third piece I've bought in this collection and I love. Would highly recommend top furniture. A good solid product. Good value for money and excellent service. I am very pleased with my new sideboard, my apartment feels more homely now. I would have liked if the delivery men could have unloaded it for me as I had to wait for my family to arrive. This sideboard is beautiful, exactly what we wanted for our living room bay, lovely colour and finish, really well made and extremely heavy, the joints are perfect. Top quality materials and workmanship, really happy with it. Really pleased with item, Well packaged good and quality is excellent. The 3 doors open up to reveal a full width shelf so you can maximise storage rather than individual cupboards. Excellent. A great addition to my existing country oak furniture! Just as advertised on web site. Excellent quality Oak product. Absolutely love this furniture. We also have the large tv unit and book case. The quality is fantastic and Tops Furniture have been excellent throughout. It is well made and it was delivered quickly, very happy with it. 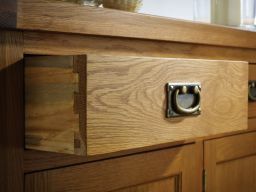 Good quality solid oak design. Very good value. Good to be phoned to confirm delivery time. Absolutely delighted with our purchase. Furniture looks fab in our newly decorated living room - really finishes it off. Now to look for some nice accessories to top it off!! Great service and furniture came really well protected in its packaging. Wouldn't hesitate to order any items in the future. Looks good , but unfortunately received with broken magnetic catch. Received my sideboard today. Absolutely over the moon with it and at a great price to. Good quality, looks great, very pleased. Lovely piece of furniture, really solid and well made. Very pleased with purchase. Many thanks to all concerned at your company starting with the order. 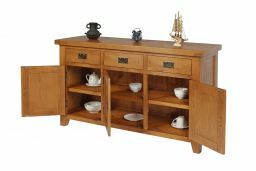 Thanks to Carl at Dartford who passed our order to Uttoxeter which is nearer to our address,and helped me through the order.The sideboard arrived exactly on the day and time we were told to expect it and the delivery men were lovely, very polite and helpful. We are thrilled with the sideboard the quality is wonderful and it looks so good in situ. in the hallway.Thanks again we would not hesitate to use your company again as we are so happy with everything and even got free delivery well done!!!! Very well made sideboard . extremely pleased at quality . THANKS .. Fantastic sideboard fits brilliantly in the space inyou living room. Great quality and amazing delivery less than 7 days! Bought two console tables and coffee table and theye transform the room. was very pleased with the sideboard. Very well packed and I found that there was nothing wrong with it, i.e. no scratches or marks ! very prompt delivery too . Really pleased with my sideboard. Lovely, solid piece of furniture. Adds to the ambience of the room. Delivered safely and on time as said it would. Recently purchased the country oak sideboard. We are both thrilled with its looks quality and value for the money. From ordering to delivery everything went smoothly. 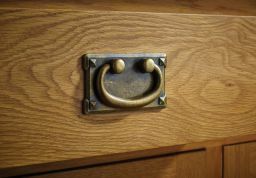 We would both recommend this company and not hesitate in using them again if we require further oak furniture items. Good quality, great price, excellent service. 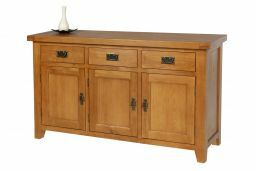 Excellent, well made sideboard at a really good price. Bought several items of furniture and they all look great. Really good customer service and guys that delivered were really helpful. Would recommend and will definitely use again. We needed a table and looked at the furniture first in the Utroxiter warehouse. First we bought 4 chairs in the clearance. 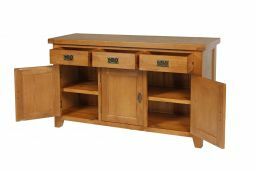 Then, we were very impressed with the country oak table (not the original one we had gone to look at and which our sideboard would have matched) so we bought the table and decided to order the sideboard to match. Furniture has just been delivered and we are very pleased. So glad we bought it. 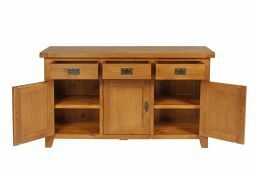 After scouring google for a solid oak sideboard and tv unit, I stumbled upon Top Furniture by pure chance. One of the things which caught my eye ,was the competitive prices. I looked through their products, and found exactly what I was looking for. I was impressed with previous customer reviews, so I decided to place an order. I now have some lovely furniture in time for Christmas. The quality of the furniture is beautiful! I will definately be buying a bookcase at a later date. The company are a pleasure to deal with, and they keep you fully informed of the progress of your order, right up until delivery. I would HIGHLY recommend! 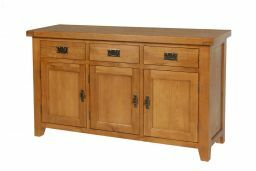 Shopped around and found this sideboard very competively priced, solidly built and sturdy, atractive addition to my home. Extremely happy with my purchase. A great product, very solid, extremely good value and exudes quality. All oak and built to last many lifetimes. 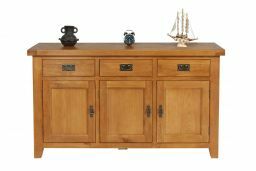 excellent quality and at a very good price, looked at other sideboards but this one seemed best and when we received it we were very pleased. The quality of the sideboard was to a high standard and extemely satisifed with what had been delivered. What we had seen in the shop was what we received. High standard of workmanship difinately value for money and compared to other high street competitors £150 cheaper. Would definately recommed Top Furniture to anyone who is looking to purchase any furniture before visiting or buying from somehwere else. Excellent sideboard, very spacious, very good quality. Best price for value. I can only recommend this product. More than pleased with sideboard, helpful staff, highly recommended, good firm to deal with, answered questions on line straight away. 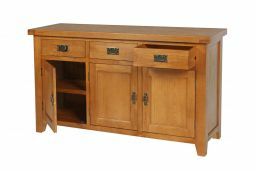 The Features of the Sideboard bought was same as I saw on the webpage. Build quality of the sideboard is really good, it's really solid wood. 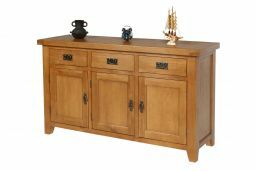 Compared the same Sideboard in shops and it was cheap with TopFurnitures. It's value for money with Top Furniture. I bought 5 items in this range, all were free from any defects and were made to good standard. My one slight observation is the left hand sideboard door does not close as positively as the other 2. However I am happy with the item. The items were on sale and were lower than list price and were excellent value for the money. Lovely sideboard! Very pleased with the quality. Looks great in our room. Very happy with the sideboard. We also bought a matching tv stand from the same range. The only issue was that two pieces did not have the exact same finish as we expected. The tv stand had slightly rounded corners and the sideboard didn't. It isn't the end of the world but we assumed they would be the same as they were from the same range. Fantastic, absolutely love this piece of furniture. Well made and solid with beautiful craftsmanship in the dovetail joints. Brilliant value for money. I have been looking for a sideboard for a while and this model from top furniture is is the best quality I have found at this price. Well finished ,can't find any niggles ! All drawers and doors work well . Look much more expensive ! Very well made, fantastic value for money. Will definitely buy from Top Furniture again. The sideboard is every thing I could wish for. It looks good, well built and worth every penny. Recently purchased a solid oak side board and nest of tables . I was very happy with the purchases. The quality of the furniture is excellent it was well packed with lots of protective covering. The delivery men were very polite and it was no problem to them to bring my items up one flight of stairs. I would definitely buy from Top furniture again. Great quality, unbeatable prices and reliable delivery. 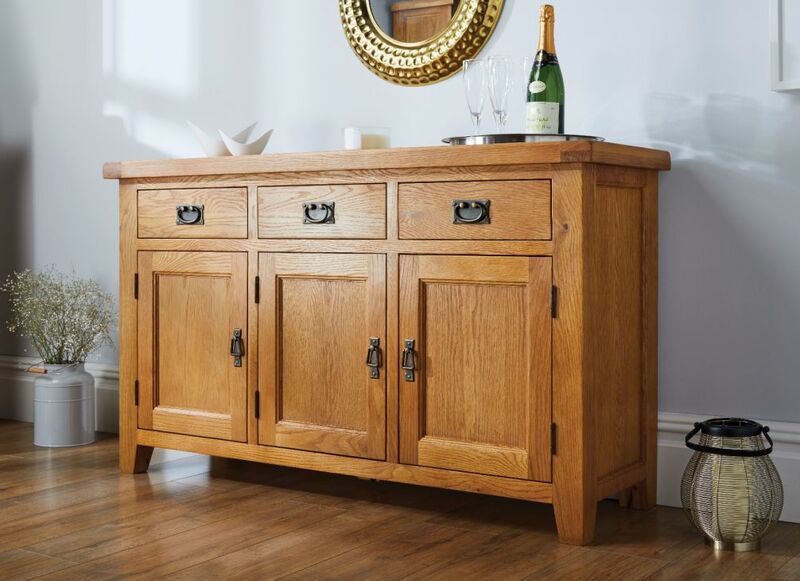 We are delighted with our oak sideboard - our second purchase from Top Furniture. The second time l have purchased from top furniture,and once again a first class service with as you say..Top Furniture too..thankyou.